﻿ Zidane: "Gareth Bale must learn from Cristiano Ronaldo"
12.09.2013 » Zidane: "Gareth Bale must learn from Cristiano Ronaldo"
Zidane Zidane has granted a short interview to Real Madrid TV this Thursday and had no hesitation in stating that Cristiano Ronaldo deserves to be regarded as the best forward in the game. The former Juventus and Real Madrid midfielder also commented on other topics as the signing of Gareth Bale, Ozil's transfer and his first impressions after being assigned with the first team's assistant coach job. 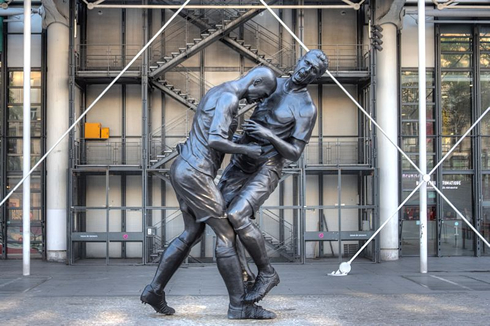 He may have already retired from football roughly 7 years ago (after the 2006 World Cup), but football fans from all around the world will surely remember Zinedine Zidane's brilliance and unique talent on the pitch for many years to come. 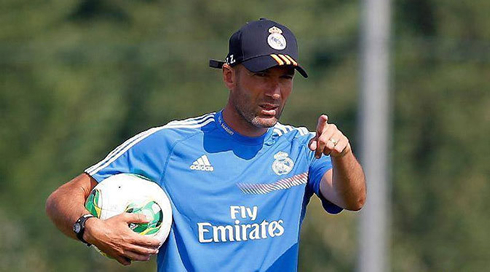 Now aged 41, Zizou is a football director at Real Madrid, as well as Carlo Ancelotti's assistant coach in the first team. In a brief talk with the club's TV station, the Frenchman approached the most recent topics about Real Madrid's daily life, which obviously means that he ended up voicing his thoughts on Gareth Bale transfer and how the Welshman can take Cristiano Ronaldo as the best example to look at, in order to learn how to deal with the pressure that he'll have to handle from now on. When Real Madrid signed Zidane from Juventus in the summer of 2001, the deal was made backed on a transfer fee of nearly 75 million euros, which at the time set a new world-record. He would score his most famous goal ever just a year after, on May 15 of 2002, at the UEFA Champions League final between Real Madrid and Bayer Leverkusen. During his 5-season journey in the Spanish capital, he scored 49 goals out of 225 appearances, which has proved to be more than enough to make him one of the club's legends. Zidane: "I didn't think being an assistant manager would be so difficult, but that's only logical these days. You have to draw the pressure towards yourself, even though the person who I think that ends up suffering more with this is the main coach. I'm just here to help him out and I've already worked with him a long time ago, so I know how good of a manager he is. 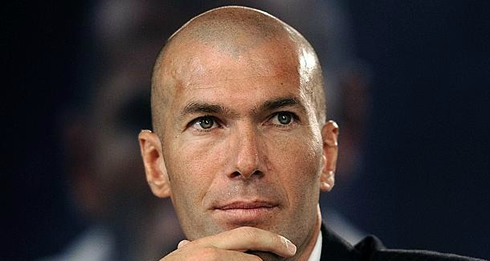 Moreover, he's also a great person...", started by remarking Zizou. We all miss seeing Zidane's incredible touches with a football, but according to the former Real Madrid #5, he also cherishes those moments just as much as us. Zidane: "I will always miss those times when I was a football player and it will always be like that because those were the best times of my life. However, it's part of the past now and we must move on. 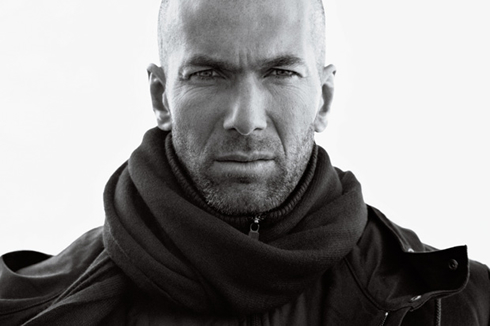 ", noted a pragmatic Zidane. Zidane: "Injuries are always bad for any team, but we have to know how to deal with that. The most important is that everyone is fit when the most important games of the season arrive. This is a particularly important year for everyone. ", pointed out the 1998 FIFA World Cup champion. One of Zidane's protegé in Madrid is Raphael Varane, the 20-year old wonder kid that the Merengues signed from Lille back in 2011, for 10-million euros. Zidane: "It's good that we're able to get a good mixture between experienced players and youngsters. The best Varane can do is to learn the most he can from players like Sergio Ramos and Pepe. He's a smart kid, who wants to learn and that definitely learns fast. I'll always be around to help and support him." As for Gareth Bale coming, Zidane insisted on the idea that he has always supported the decision of bringing him in to Madrid and that he believes that the former Tottenham player will have a huge impact on the team. Zidane: "I think that Bale's signing will be very important for Real Madrid. He has been the best player in the English Premier League for the past two seasons and I'm sure he'll help us a lot. Unfortunately, part of the press seems to have misinterpreted some of my words in the past weeks. When I remarked that Bale's transfer price (91 or 100 million euros) was too much money, which was something that even our president has stated, it was only meant to note that such an amount of money will put him under a lot of pressure. That's at least what happened to me when I signed for Real Madrid in 2001. I've always given an encouragement word to our president in order for us to bring in Bale, because Real Madrid must always sign the best players who are available in the market. That's why we are the most valuable club, otherwise it wouldn't be possible...", commented the 41-year old football director. Zinedine Zidane: "The pressure one player feels at Real Madrid is huge and it won't be any different with Gareth Bale. However, the best example he should look to is Cristiano Ronaldo, who still is the most expensive football player in history and who managed to deal succesfully with the incredible pressure that was put on him, delivering outstanding performances and results. Nowadays, Cristiano Ronaldo is better than anyone else just because of everything he has been doing. He is the best forward in the World. I'm also excited to see that we have very creative players in the team as it is Isco, and that Jesé and Morata will increase our competition level in the attacking positions. I'm glad to know we have players who responded to this with strength and willingness to work even harder like Angel Di María, but there were also cases where this didn't happen. Mesut Ozil, who first of all is a splendid football player and who has given a lot to the club, quite simply decided to walk away from us. We have Isco now though and I think he could be the missing piece in our midfield", concluded Zidane, as he justified Ozil's departure from the club coming mainly from an attitude problem. Cristiano Ronaldo next game for Real Madrid will be for the Spanish League "La Liga" against Villarreal, this Saturday (September 14, 2013), at the "El Madrigal". You can watch Juventus live stream, Villarreal vs Real Madrid, Barcelona vs Sevilla, Manchester United vs Crystal Palace and Sunderland vs Arsenal, all matches provided from our live soccer section.